Numerous political pundits have lamented Hillary Clinton’s comments about what went wrong in the 2016 presidential election. She has a right to express her feelings and all the media banter about the damage she doing to the Democratic Party by being a sore loser and a whiner is political codswallop. These put downs are not only sexist but devalues her extraordinary public service, insults her intelligence and really misses the point. Mrs. Clinton is a human being with genuine feelings and thoughts. She has paid her dues as a public servant and proven her mettle as a thoughtful, competent Senator of New York, Secretary of State and adviser and political aide-de-camp to husband Bill. Moreover, she conducted herself with dignity through his humiliating impeachment and bravely survived one alleged scandal after another by her political enemies who have muckraked and attempted to beat her into a political pulp since her husband ‘s first term in office. Given all the boondoggles of the Trump presidency, had she been elected President, I doubt that we would be nose deep in the current political mess with its pervasive global reek. Contrary to her detractors, she has never professed political infallibility or claimed immunity from the slings and arrows of American power politics and has taken full responsibility for her missteps in the last election. If she ran for such high office again, I am sure she would execute some things differently as would most intelligent people who learn from experience, for hindsight is mostly twenty-twenty. 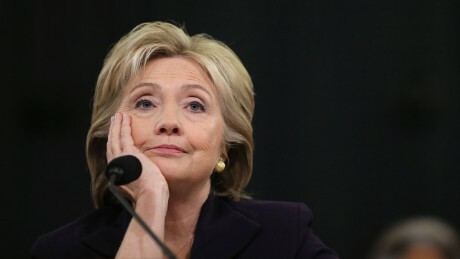 But as an experienced public servant with keen insight, common sense which is not common, and a capacity for critical analysis, she also understands how FBI Director James Comey may have sealed her presidential fate; how the American electoral process is fragile, vulnerable and broken, and how Russian cyber attacks against her campaign may have vaulted the eminently less qualified political neophyte Donald Trump into the Oval Office. As a political insider who is well aware of the strengths and weaknesses of our current political system, and as one who has endured her political trials by fire, Mrs. Clinton probably feels cheated as may countless other Americans. Ridiculing her right to express her feelings in the aftermath of what may turn out to be America’s form of political Armageddon reflects a childish thinking begging political adulthood. Mrs Clinton will be over it when she gets over it. She is speaking a painful truth worth heeding in our current political crisis. We must learn from our mistakes and have the courage to speak about and correct them.